With school starting again in a couple of weeks, I know many of you are making preparations. In my case, I went to get my school ID on Monday, and next week I’m going to get my schedule, locker, and textbooks. I knew I was going to get my ID that day, and I planned on putting on a light face of makeup, but that didn’t happen. Instead of getting ready like I should have, I was lounging around and finishing an episode of Law & Order: SVU (I know. I’ve been told I’m a old person in a young person’s body). In the end, I put on face makeup and did my brows. I didn’t do anything else. No lipgloss, eye liner, or mascara. This was extremely regrettable because my picture came out awful. Hopefully, when I go back in to get my off campus ID I’ll be able to take a new pic like I did last year. Anyways, this little mishap made me think that I should make a post about a makeup essentials for beginners, especially with school around the corner. I know that there are a gazillion videos covering this topic on Youtube (I used to watch them myself), but I feel like they still include a lot of products for beginners. This inspired me to make my own post with products that I wear daily to school. I’m calling this a beginners/minimalist bag because I feel like I’m including only products that you truly need. Just these products alone will make a difference without looking like someone else. So in this post, I’ve included what I think are the basics, but I also talk about some extras that I think also help maintain and enhance your look without going overboard. Like Bobby Brown always says, makeup is about enhancing what you have. In order to apply my face makeup, I either use my Beautyblender-esque sponge or this blush/bronzer blush. I like using the sponge because I feel like it gives nice, even coverage, and I can use it under my eyes. The downside is that it can take some time to completely blend everything out. On top of that, you have to clean it every once in a while, which I’m pretty bad at. For days when I’m rushing, I’ll use the brush. It’s supposed to be for bronzing and blush, but it resembles a stippling brush, so that’s what I use it as. In general, I like using these two items over a actual foundation brush because the product blends easier and doesn’t leave any streaks. My sponge was from Marshalls for around $5. I’m not sure how it compares to the real Beautyblender, but I refuse to pay $20 on a makeup sponge. The brush is from a random set that I got from Walmart. 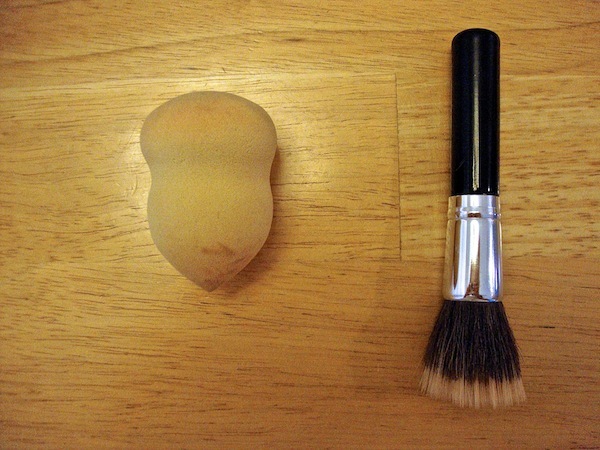 Though the brush isn’t the softest one out there, it gets the job done and is affordable. Every morning, I either use BB Cream (though I don’t recommend the one above, I’m just trying to use it up) or tinted moisturizer. For everyday makeup, I choose these because I’m just going to school, I don’t need heavy coverage. Not to mention that wearing high coverage foundations every day is bad for your skin. 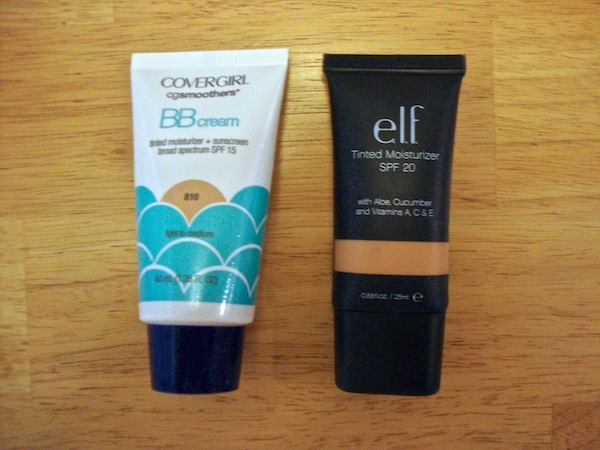 This Cover Girl BB Cream is the only drug store one I’ve tried, but I’ve heard many good things about the Garnier one. As for this E.L.F tinted moisturizer, I think it’s great for the price. I think it was about around $3 at Target. They also have numerous shades so if should be fairly easy to find one that matches. Online, Urban Decay is having a big sale, so you can get their Urban Defense Tinted Moisturizer for $5!! This is such a steal, with the original price being $30. When you use face makeup with lighter coverage, odds are you’re going to see any dark spots or hyper pigmentation that you have. Because of this, I use a concealer. The one I use contains salicylic acid and helps with any breakouts. Since this concealer is for acne prone skin, it’s not very creamy. If you have acne, I really recommend the Almay Clear Complexion Blemish Healing Spot Concealer. It’s my go to; I think this is my 3rd or 4th tube. If you don’t have acne and want a creamier concealer, try out the Hard Candy Glamoflauge concealer ($6). I purchased mine from WalMart, but never use it because the color isn’t right. If you’re in high school, chances are you have dark circles from staying up late because you were on the computer or watching TV for 3 hours instead of doing your work. Since this describes me to a tee, concealer and highlighter are my best friend. Many under eye concealers now claim to conceal and highlight, but I use two separate products because that’s just what I have. First I conceal the dark circle, blend with my sponge, then add a pink highlighter and blend again. For your under eye concealer, it’s best to get one that that is 2 shades lighter than your face. This in itself will highlight and brighten the entire area. You can also use your highlighter, if you have one, on any high points on your face, like the bridge of your nose or your cheekbones. Of course this is optional. I don’t normally do this step. 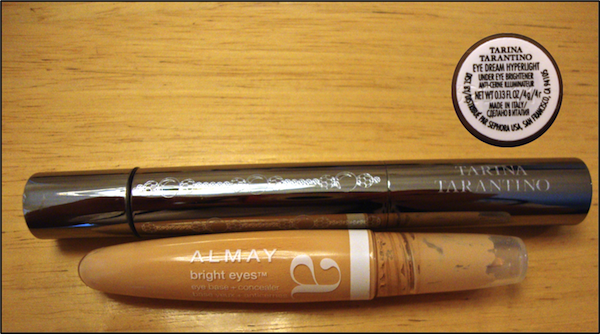 The under eye concealer I’m using is Alway Bright Eyes, which I think is the old version of the Almay Wake-Up Under Eye Concealer. This one is really gross and I need to get a new one that is lighter, but I haven’t gotten around to it. As for my highlighter, I use the Tarina Tarantino Eye Dream Hyperlight which is actually discontinued. I might end up getting the Maybelline Dream Lumi Touch, Maybelline Instant Age Rewind Eraser, or the Rimmel Match Perfection Concealer to replace these products. There is also the very affordable E.L.F Studio Duo Concealer and Highlight ($3). For the most part, I use black liquid liner on a daily. Occasionally, I’ll use pencil when I want to use brown for a more natural look. Of course you can use liquid, pencil, or gel. As for colors, I would suggest black, brown, or a dark plum. If you’re just starting to use liner, I suggest using pencil because it’ll be the easiest to apply. The downside to this is that, I feel like pencil has the shortest longevity. If you have oily skin, I’ve found that even the higher end liners, like Urban Decay’s 24 Hour Glide-On Liners, still smear. 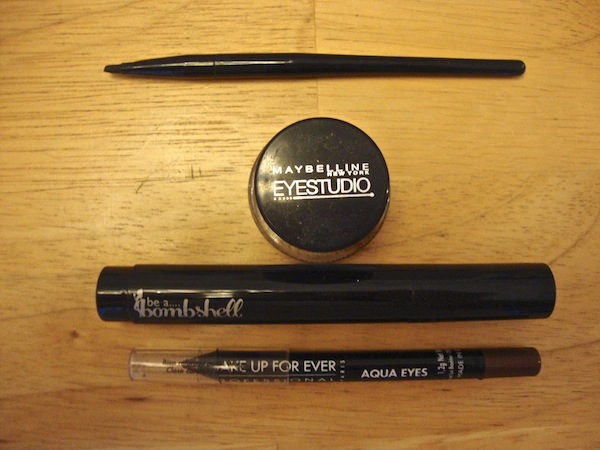 The same goes for gel liner; it collects in the order of my eyes after extensive wear. In my experience, it lasts much longer than pencil, but this probably takes the most time and skill. Though gel is often the most pigmented, I would advise against it since it takes longer to apply. Now on to my personal preference! I love using felt tip liquid liners because once you get the hang of it, they’re quick and don’t budge (usually). Liquid liner is the Mama Bear of liners. I find that it’s not the easiest to use, but not the hardest either. *Note: Sometimes I use eye primer before applying my liner. I do this because it can help the liner go on smoother and last longer. I don’t do this all the time, but I’ll do it on days that are especially hot. 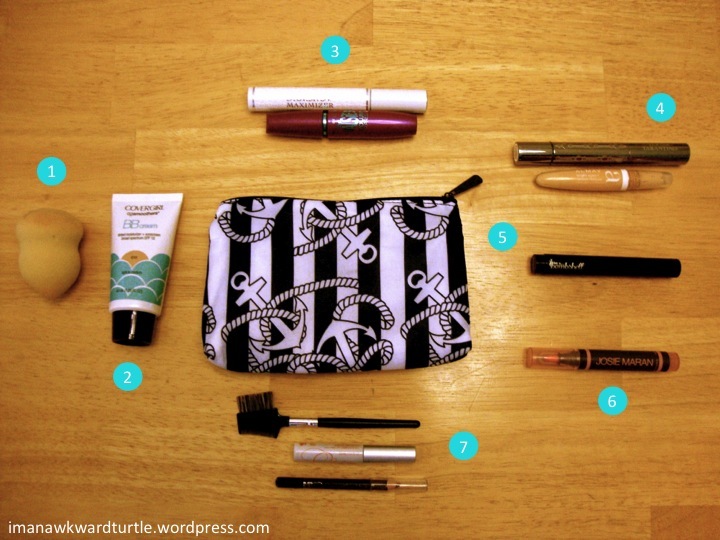 I currently use the Mirabella primer that was included in my Ipsy bag, but there are many drug store alternatives. There is the NYX HD Eye Shadow Base ($7), NYX Eye Shadow Base ($7), Milani Eyeshadow Primer, and the E.L.F Eye Primer & Liner Sealer ($3). Another optional step if you have extra time is to highlight your eyes. Even when I first started out, I used white liner to line my lower waterline and inner corners to brighten my eyes. Unfortunately, it doesn’t last all day on my skin, but I still like having it. I don’t always do this step, but it really does help you to look more awake. Mascara is my absolute favorite makeup product. If I could only have one beauty item, it would be mascara. Mascara paired with liner really helps to open your eyes and make them appear bigger. Before I apply any mascara, I first use the Diorshow Maximizer Lash Plumping Serum. This primer is amazing! I’ll be honest, at $28.50, it’s crazy expensive, but totally worth the splurge in my opinion. Like any other primer, it helps to extend the longevity of your makeup. It gives my lashes a slight curl without having to use a curler (I stopped using it since my lashes are so thin and can break easily). It also keeps my mascara from transferring and I don’t get raccoon eyes throughout the day (Of course this is optional if you have long, luscious lashes or if you use waterproof mascara). After that, I go on to mascara. 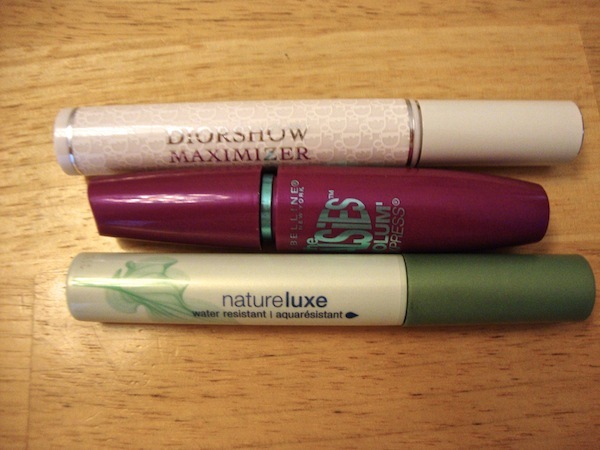 My favorite drug store mascaras are Maybelline Falsies, Cover Girl NatureLuxe Mousse Mascara, and Flower Zoom-In Ultimate Mascara. Falsies is great. The wand it big, which means that mascara can get on your lid, but the wand is super flexible which allows you to coat all your lashes quickly. The NatureLuxe mascara is a bit expensive for a drug store product, but it is less harsh and has a nice honey scent. 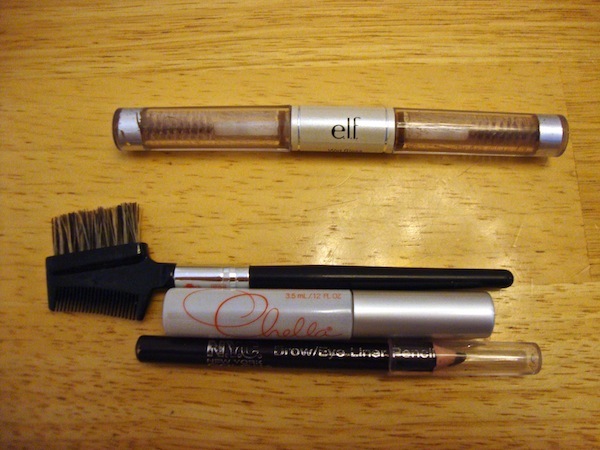 It has a thinner brush, which lets you get at the base of your lashes and makes them look great. Lastly, the Zoom-In Ultimate mascara is the coolest, but on the pricer side. It has three wands! Just a turn of the knob and you can lengthen, curl, and volumize. The con to this is that you spend more time applying mascara, which may not be the best thing to do if you’re in a rush. I think lip stain is the best lip product because it gives your lips color without being sticky or too shiny. It is especially ideal for me because, believe it or not, I don’t retouch my makeup throughout the day. I’m horrible at it. Even if I go to the bathroom, I barely allow myself a glance because I’m either in a rush or someone else is hogging the mirror. Since I don’t retouch my makeup, the stain will obviously, stain my lips for a while, and I don’t have to apply it as often as I would any other lip product. You can also apply it without a mirror, which may not be the case with lipstick. This Josie Maran lip stain was from my one of my Ipsy bags and I love it. I know it’s also a cheek stain, but I never really use it. I don’t feel the need to have blush or cheek tint on a daily basis. 5Other lip stain-ish alternatives are the Revlon Colorstay Just Bitten Lipstain + Balm and Revlon Just Bitten Kissable Balm Stain. I haven’t tried any of these, but I have a friend that likes the balm stain. The thing about the balm stain is that initially it looks like a a lipstick and then eventually stains. On the downside, I think it can be a tad drying (based on what I’ve seen). Another option for those that want something more moisturizing is a tinted lip balm like the ones from Softlips or Burt’s Bees. For me, primers are a complete must! Especially since I have oily skin or live in an area with sweltering heat. If you don’t have greasy skin, you can go without it. This is an absolute necessity for me because if without it, I would look like a grease ball within an hour and my makeup would just melt off. The primer I just got was Benefit’s 15 Hour Primer. This primer is crazy expensive, but it works. For drug store alternatives, I would try E.L.F Mineral Infused Face Primer, which I used when I first started out, or maybe even L’Oreal Studio Secrets Magic Perfecting Base (I’ve never tried this, but heard it was good). Like primers, setting products are only necessary if you live in a place that is scorching or if you have oily skin. I don’t wear powder regularly. I normally only put it on when I actually remember. I guess I often forget about powder is because I don’t have it on hand. I actually use rice flour and just dust in over my face. For the most part though, I use setting spray. 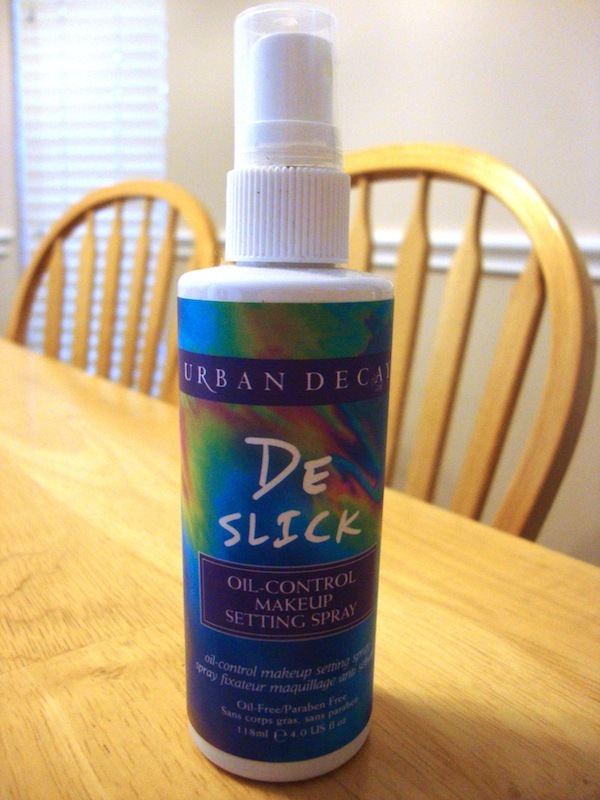 The spray I use is Urban Decay’s De-Slick setting spray. I’m using the old formula. To be honest, I’m not sure if this actually helps, but just the thought of having it makes me feel a little better. Whichever setting spray you use, make sure you read the directions correctly. For example, mine says to spray just before applying face makeup and then again your you’re done with your makeup. The only drug store alternative I’ve seen is the E.L.F Makeup Mist & Set ($3), which I’ve never tried. This is another product that is helpful if you have oily skin. I always keep a pack of these in my backpack, but I’m really bad at actually using them. Hopefully, I’ll be better about it this year! 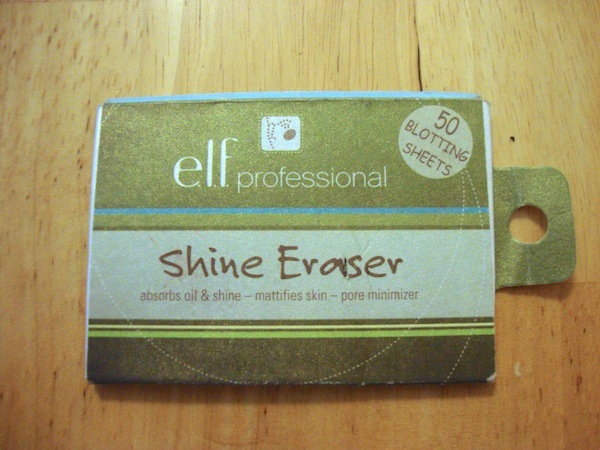 These E.L.F sheets are crazy inexpensive! They’re only $1! Unfortunately, I think they’re only sold online. You could also try the NYX Blotting Paper ($6). They have various kinds (Matte, Fresh Face, Green Tea, Tea Tree) depending on what you need. Until now, I didn’t even know they made them, so I’ll probably give them a try. Another alternative is the Clean and Clear ones, which are the most expensive (around $8), but have a nice case that allows you to drab one sheet at a time. On the left, you have my super gross ID pic, with little makeup. On my face: BB Cream, Under Eye Concealer and Highlighter, Spot Concealer, Brow Pencil and Gel. 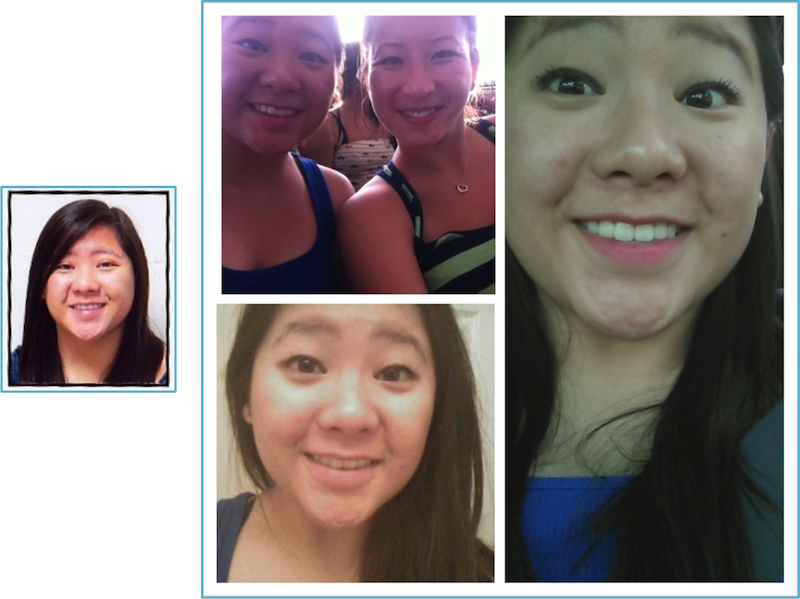 And on the right, I have pictures from before, during, and after the Jonas Brothers Concert. On my face: Tinted Moisturizer, Under Eye Concealer and Highlight, Brow Pencil and Gel, Eyeliner, Mascara, and Lip Tint. I know that lighting needs to be taken into account, along with the fact that you always look better when you take selfies, but you can tell that adding just a few more products really does make a difference. Just these products enhanced my face. There was no need for bronzer, or blush, or even highlighter, because I didn’t highlight the high points of my face! That’s it for my first back to school post! I hoped that it was helpful :) If you know of/tried any good drug store alternatives for any of products I talked about, please leave them in the comments! I’m always interested in trying out new things. Also, I’m also thinking of making my own agenda this year, so I might have a DIY Agenda tutorial coming up! Like this post for more back to school related posts.